TEDxBangkok 2015, Bangkok’s first full-scale, world-renowned talk series for ideas and creativity, took place on June 13th 2015 at Aksra King Power Complex Theatre with 18 TEDx Talks. It brought together some of Thailand's foremost thought leaders, change makers and everyday people from each discipline - as speakers, attendees and enthusiasts. 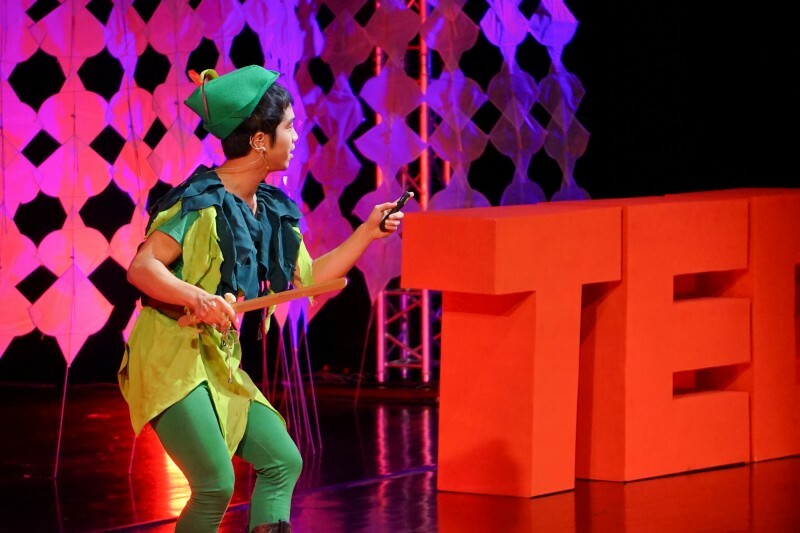 TEDxBangkok 2015's theme was ‘Catching The Ripples’. Inspired by a quote by An Xiao Mina at TED Global 2013 – “In order to see where the wave is coming from, you have to look at the ripples”-, the theme was a challenge to both speakers and attendees to transform their ideas into tangible action that would make a positive difference in their communities, and subsequently, the whole country. After all, every movement in the society came from small ripples which accumulated into a gigantic wave. The conference was divided into 4 sections; ‘Still Water’, ‘Crosswind’, ‘Propagation’ and ‘Full Speed Ahead’, featuring a wide spectrum of ideas delivered through brief, straight-forward talks covering all topics, from science to creativity and politics to drama. Next up in ‘Crosswind’, Mahisorn Wongphati, a Robotic Engineer, introduced himself as the ‘Nation Builder via Robotics’. As a driving force behind the Intelligent System Laboratory 2 (ISL2) at Chulalongkorn University and a former RoboCup champion team, Mahisorn encouraged the audience to believe Thailand “as a nation that can, and should, produce robots second to none” by showing some exemplary projects of how useful robots can be for humans in certain situations. Finally in ‘Full Speed Ahead’, some of the most interesting presentations came onstage. Among others, Natavudh Pungcharoenpong, Tech Entrepreneur and Founder of Ookbee, a leading digital publishing platform in Thailand and expanding across South-East Asia, explained his not-so-secret business recipe of “simply offering a new way for people to read their favourite publications by bringing them to smart devices and at the same time, making it cheaper and friendlier to use.” He also suggested that it may be the right time for some forward-thinking in order to apply start-up ideas to the non-tech world. These ripples caused from TEDxBangkok 2015 did not seem to end with the event. Now, through the ideas laid out at the conference, it´s about time for Thailand to create a better understanding among people, before early next year, when TEDxChiang Mai takes the baton. In the spirit of ideas worth spreading, TED created a program called TEDx; a program of local, self-organized events that bring people together to share a TED-like experience. A platform for ideas worth spreading, a dialogue, a call for action, and a community of people who believe in ideas, creativity, innovation and collaboration. Apart from the annual large creativity and idea forum “TEDxChiangMai”, some smaller TED events & activities are organized throughout the year. For your info, another TEDx will be taking place here in Thailand: TEDxChiangMai 2016 on 30 January 2016.